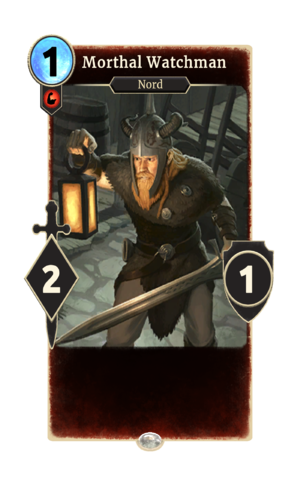 Morthal Watchman is a common Strength creature card. It is part of the Core Set. "Halt in the name of the jarl!" "Face me you skeeving horker!" "I'll send your soul to Sovngarde!" The card is named for the Skyrim town of Morthal. This page was last modified on 14 February 2019, at 00:11.